The cameras are arbitrarily divided into several groups, inevitably some cameras will fall into more than one description, ie: a No.2 Folding Brownie will appear both in Brownie Cameras and Folding Cameras as well as in the film size category. By definition if a camera doesn't "fold", that is, have bellows, it's a box or viewfinder camera, if there is no other classification to suit. These categories are loosely on the definitions used in the very fine book "Kodak Cameras, The First Hundred Years" by Brian Coe (ISBN 906447-44-5). Unlike some other publications, this book actually covers almost all of the "Kodak" and "Brownie" branded output of Kodak in the various countries where they have had manufacturing facilities, although inevitably there will be one or two omissions. Hawkeye, Graflex and Premo cameras are merely listed, rather than detailed with photographs. The more esoteric specialist and professional cameras are not covered at all. Many of the cameras are described as 'snapshot'. A basic definition of this would be "sun over the shoulder, two hours after sunrise until two hours before sunset". While most of these cameras are quite capable of producing good results given the right conditions, their capabilities are limited. Some of the cameras are described as 'premium'. These are cameras that were not normal retail items, but used for promotional purposes, often by third-party companies, to encourage customers to take advantage of their goods or services. Inevitably, they are usually of fairly basic specification. Most of the pages have a list of specifications of the camera that has been gleaned from various published sources, especially Kodak's on-line Customer Service Pamphlet AA-13, Brian Coe's book, "Kodak Cameras, The First 100 Years", John T. Addison's publication, "A Catalogue of Hawk-Eye Cameras" and Joan C. McKeown's "Catalog of Premo Cameras". A box camera is just that, a box, and as such never has bellows. Kodak produced many cameras, usually of comparatively limited specification, under the "Brownie" brand name. In an effort to capitalise further on the advances in film technology and the popularity of the quick-loading Instamatic cameras, Kodak introduced the Disc format in 1982. 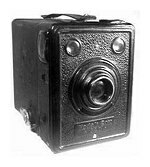 From the 1890's until 1960 Kodak produced about 200 different models that used bellows to allow the construction of a camera that was relatively compact when folded. Many Hawkeye cameras were used as promotional or "premium" items, often by third-party companies, to encourage customers to take advantage of their goods or services. Kodak wanted to compete with Polaroid on the "instant picture" market. They did get away with that, for a while but then they had to take their system out off the market. These 35mm cameras produced by Kodak AG in Germany, the folding Retinas and Retinettes are very neat and compact, still very usable and arguably the best quality cameras Kodak has ever produced. Following the almost runaway success of the 126 Instamatic cameras, Kodak introduced the 110 cartridge in 1972 with both black & white and colour print emulsions as well as slide film. 120 Roll Film was introduced in 1901 and is still the second most popular film format. It was being used in simple box cameras and folding bellows cameras and is currently the most popular film format for use with professional medium format cameras. In order to make film loading easier, Kodak introduced the Instamatic film cartridge in the early 1963 which was aimed at the consumer market. Kodak introduced 127 film in 1912 with the advent of the Vest Pocket Kodak. At the time it was considered to be a "miniature" format, but nevertheless soon achieved popularity because of the compact size of the cameras. Kodak introduced 620 film in 1931 with the US model of the Six-20 Kodak and at almost the same time stopped producing cameras taking 120 film. In the end the 120 format prevailed. Kodak introduced 828 rollfilm in 1935 in conjunction with the original Bantam f/6.3 and f/12.5 cameras, no doubt to provide a cheaper alternative introduction to 35mm photography for the masses. The 135 cassette as used by all 35mm cameras today was actually introduced by Kodak with the original Retina in 1934. Today it's still the most popular film format in use. Advantix cameras for Kodak's "Advanced Photo System". These cameras really do go back to the original Kodak concept of "You push the button, we do the rest".